I love to make little cardboard houses for each season. Halloween houses remain my favorite ones to make, but other seasons call to me as well. 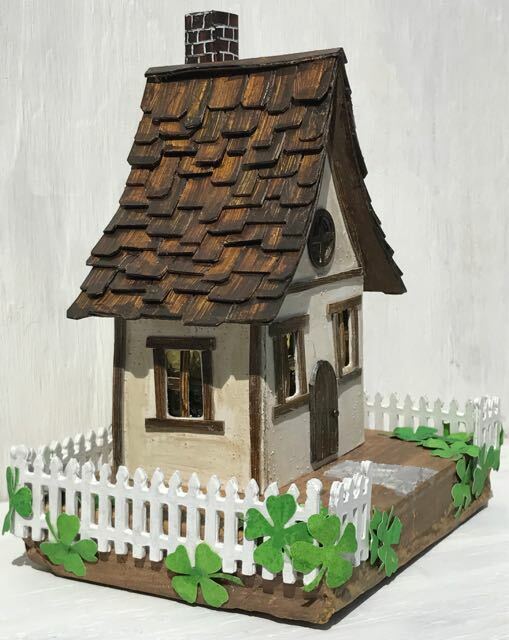 This St. Patrick’s Day house is an Irish cottage with a “wooden” shake roof, a white picket fence covered with 4 leaf clovers, and a stone walkway. One of the features I was experimenting with is the curved roof. I like how the shakes look on this curved roof. When I glued them on, I curved each shake slightly with my fingers to help them to adhere better. I really like the effect. 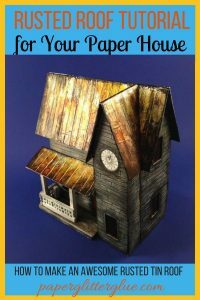 I will make a pdf of this simple cardboard house pattern that I can share with you – probably in a week or two to get it ready. I have to work a fair amount this week because I was on vacation last week which slows down my creative process. Easy when you take it one step at a time. Here’s a little more detailed information. The pattern itself is very simple – it is a basic gable house with a gently curved roofline. 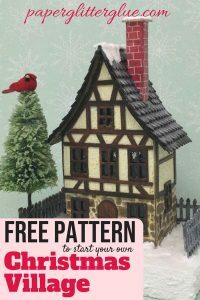 As I mentioned earlier, I will have a pdf available in a week or two of the pattern including window placement, roof pattern and the chimney pattern. I generally make my patterns so they fit on an 8.5 x 11 piece of paper and cardboard. It makes a nice small house. You can make it whatever size you want depending on your sources of paper and cardboard. 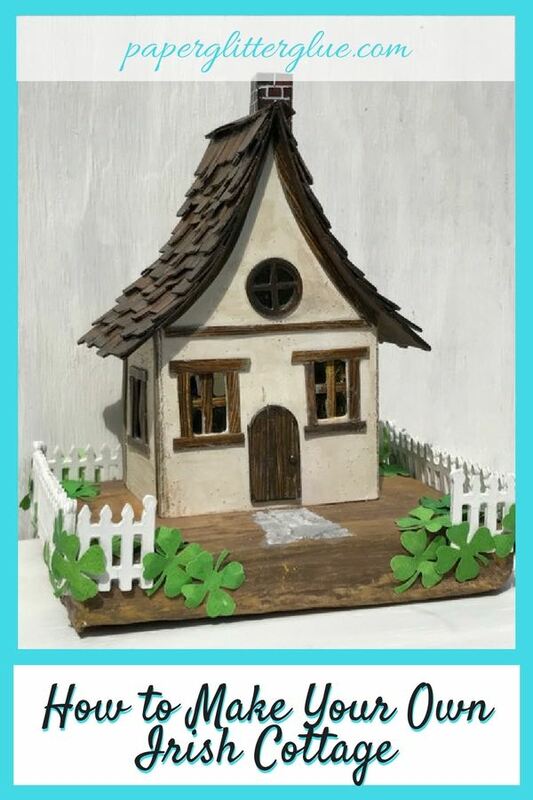 Close-up view of the Irish Cottage St. Patrick’s Day House where the painted plaster is visible. I always prime my houses with gesso to make them more sturdy and to help the paint adhere more effectively. 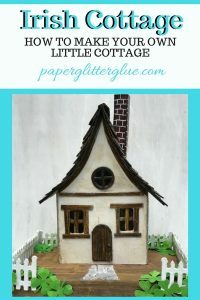 Since I wanted this house to look like an old Irish cottage, I painted the cardboard with a mixture of gesso, Distress Paint Antique Linen and sand to give it an old plaster look. I distressed it a little further with some Walnut Stain distress oxide ink. To make the wood trim, I generally paint cardboard with a yellow ochre paint, followed by burnt sienna, and then burnt umber. I love these colors to simulate wood grain. I cut out strips for the window trim, the doors, the trim about the edges of the house and for the wooden shakes on the roof. After researching Irish cottages a little more, I think the roof should have been a thatched roof, but that wasn’t in my mind when I started this house. One of my online buddies, Jennifer, made a thatched roof from embroidery floss which is really cool on her Irish cottage. Once the glued on trim on the house was dry, I folded the house into a rectangle and glued the back seam of the house together. Be sure and let that glue set before you glue the roof on. If you try to glue the roof on when the house is a little flexible you will get a wonky roof with uneven overhangs. You know wonky overhangs just won’t do. Truly, the hardest part on the actual construction of a little house is gluing on the roof; the curved roof is just a little more challenging because I had to hold the curve down to make it stick to the curved roofline. That means, once again, I walked around the house firmly holding the roof in place until the glue sets. In general, it is easier to glue shingles to the roof before the roof is glued to the house, but since this roof had to curve, I needed to glue the roof on first. I just glued the “wooden” shakes to the roof in a random pattern. I made a ridge cap to cover the top edge of the roof, but I didn’t fold it quite right and I didn’t really center it when I glued it on, but it’s tolerable. I made the base my usual way – gluing layers of cardboard together which had a square cut out so I could insert an LED light. I always love to add fences to my houses. This fence is from Tim Holtz Sizzix Village Bungalow die. I had a number of them already cut out so I just glued several layers together to make them really sturdy and glued the fence pieces around the edge of the cardboard base. Since this is a St. Patrick’s Day house, I decorated the house with numerous 4-leaf clovers on the fencing and around the edge. The clovers were made from a Tim Holtz punch. I sprayed watercolor paper with Mowed Lawn Distress Stain to make the clovers. It’s my favorite green color. I have to order more paint and stain in this shade because I use it so much. The final decorative element is the stone walkway. I stenciled the stone with Ranger texture paste through the Stamper’s Anonymous Mini Layering Stencil – set 28. 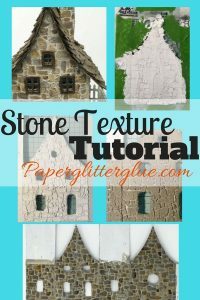 I love this stencil for making anything look like stone. I taped the stencil to the base leaving only the width of the pathway open for the texture paste. Once the texture paste was dry, I painted it with Distress Hickory Smoke paint. I need to grunge up the stones a little bit more and add a little grass to the base of the house. And that’s how you make the Irish Cottage for St. Patrick’s Day. I hope you’ve found some creative inspiration in this post. 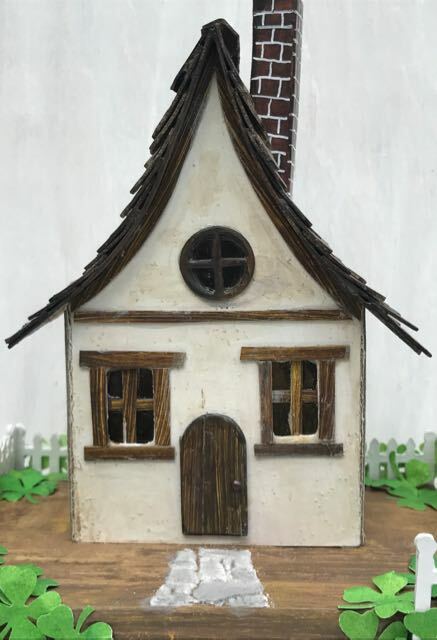 Please let me know if you have any questions about making this little house. And I love comments and pins. Thank you for stopping by. Happy St. Patrick’s Day! Addendum: Since my projects take so long it is hard to make them in time for online challenges. I just knew that one of the challenges would be St. Patrick’s Day or have something to do with green, but no, I couldn’t find one. 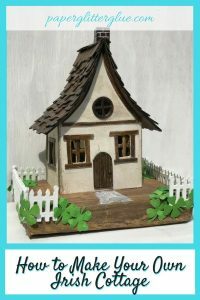 But right after I posted my Irish Cottage, I found the Frilly and Funkie challenge for the next 2 weeks is “Knock on Wood” so I was able to share my project with them. I forgot to add a link though so I am doing that now. Be sure to check out the cute projects on that page. Addendum: I was one of the Top 3 for the Knock on Wood challenge. I am very honored to be chosen. Please fell free to pin any of the images to your favorite board. oh wow, what an amazing project! I can see how much work and love you have put into it. Thank you, Eleanor. 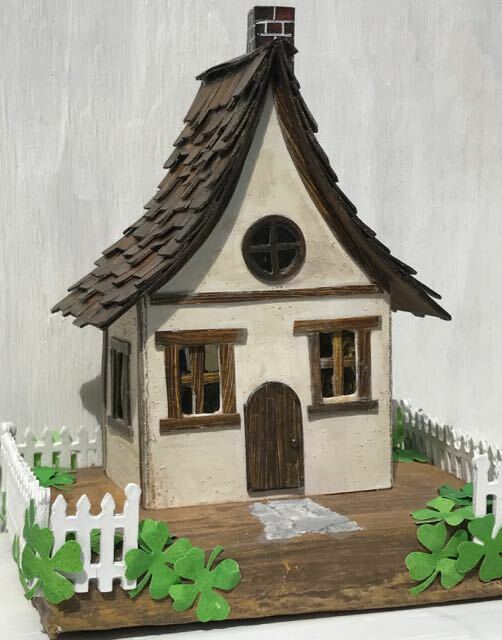 I am kind of crazy about making little houses. It is my favorite craft. I am going to use your coloring technique on a Halloween house. 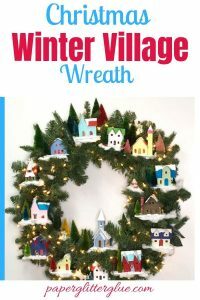 Every year make a bunch of them and sell them to benefit Habitat for Humanity. I haven’t really started yet this year, but soon I will. Nancy, thank you for looking at my projects. I just love to make things, don’t you? I hope you can find some inspiration here. Well the first thing that caught my eye was the curved roof and the shingles on that roof. Quite striking! especially with your color choices. And I love the clover. Great details in the house and in your explanation. I really appreciate your sharing the paints you use to get the wood grain effect. Thank you for stopping by my blog. I just barely set it up about a week ago. This is my very first post on the new blog. I haven’t done a lot of work yet – need an about page, widgets, a menu, more structure, etc. Lots more work to do. I did see that you had a new blog too. I think it is a word press blog as well. Yours is very nicely designed. Yes, I would be happy to answer questions. I think you have my email. Let me know. I love the shingles of this Irish cottage! Thank you, Lynn. I thought you were in the Grand Canyon at this time. I always look forward to your adventures. Lucy, first of all, I love the look of your new blog, it has a lovely fresh look to it! 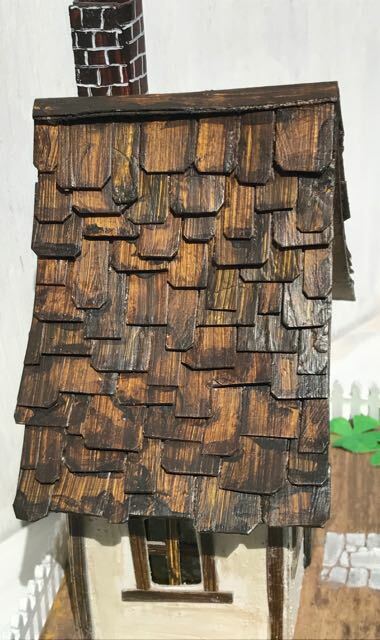 Your Irish cottage is beautiful, I love the look of the ‘wooden elements’ and the shingle roof is a real stunner – you did a brilliant job gluing the shingles down on the curves. Pinned! I have lots to do to get the blog set up properly. Logo, headers, widgets, about page, etc. etc, but I think it will look nice when I am further along in the process. Thank you for stopping by. You know I always love to hear from you. I came from your old blog, and am poking around trying to find out how to ‘follow’ you here, Lucy. Can you let me know? I love your new design–good for you to be creative in that respect, too! It looks like I have a lot to catch up on in terms of your most recent posts–life has been getting in the way of regular blog visiting. Oh, I see the follow box below…giving that a try. Sara, I haven’t really encouraged followers yet because I want to do it right. I want to send out a newsletter with up-to-date posts rather than a generic email when I write a new post. On my blogger blog it automatically sent out an email every time I published and then edited my post if I found a typo (which happens often). That means I have to sign up with a email management system (argh!!) which hasn’t been done either. I am VERY happy to have you as a follower, but I just want you know it’s not set-up the way I want it to be done at this time. Love this house. Your roof is spectacular. The whole house is just so charming! I am going to figure out how to a thatched roof one of these days. I love the thatched roof that you recently made. This is one of my favorite house patterns – I love the curved roof and the window frames. Thank you, Kathy. I do love the wood shingles, but if I can ever figure out how to do a thatched roof, it will be pretty cool, too. 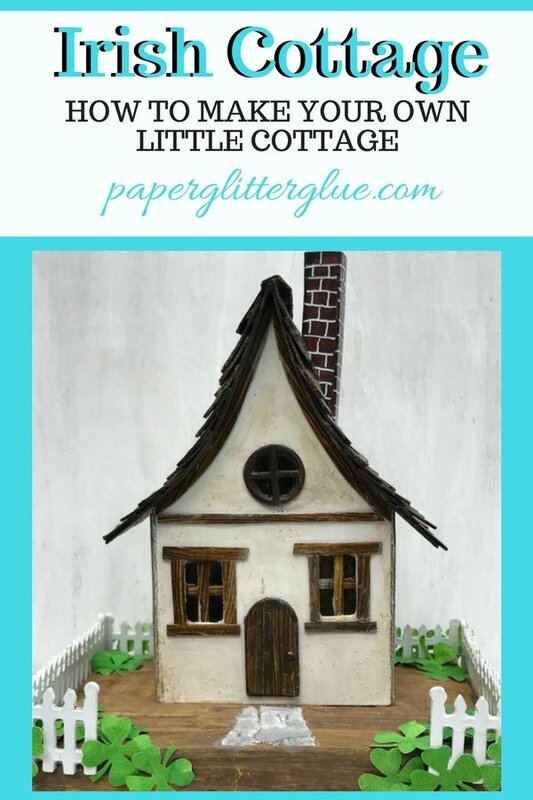 Your little cottage is wonderful and the “wooden” shakes look so realistic and are so well laid out. hanks for joining us at Frilly and Funkie. Congratulations on being chosen as one of our Top Three at Frilly and Funkie in our Knock on Wood challenge! Your house is amazing! Hugs!